I recently acquired copies of some of my x-rays and came across the ones of my pelvis. Three surgeries on my pelvis have been performed with the first occurring four weeks after the collision. 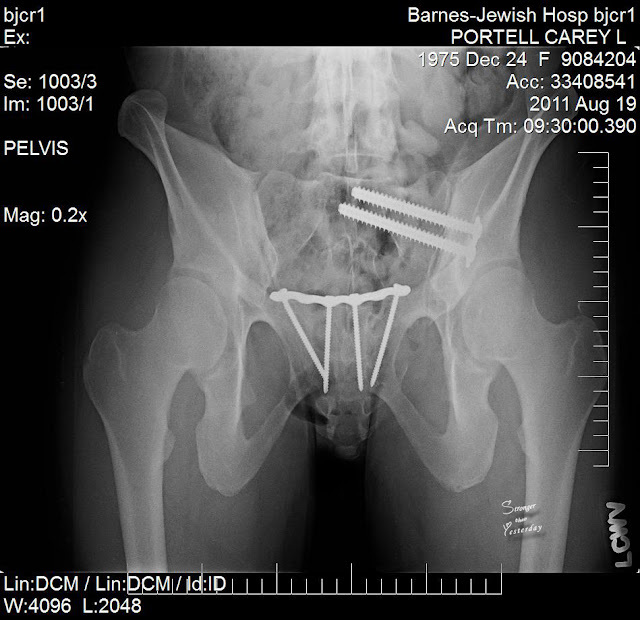 External fixators had already been placed in both of my lower legs. The trauma surgeon had tried to piece my right fibula back together and he set my dislocated left ankle back in it's correct position, while screwing those pieces back together as well. So I had already had a few surgeries before this first pelvic one. Viewing these x-rays brought back the memories of that surgery because it was the first surgery that I remember. I'm saying I don't have even a snippet of the first surgeries of my ankles in my memory. None. Apparently that was a blessing for myself. Reconnecting my bones, tendons and nerves bore a pain so barbaric that my conscious has blocked it out. 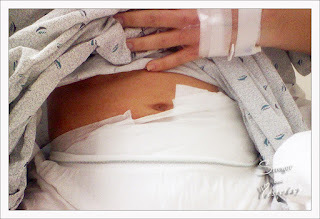 The high and thick wall of Dilaudid was not enough to overcome the waves of torment that crashed into my body relentlessly those first few operations. But, let me tell you, that first pelvic surgery was combined with another surgery on my right ankle and I was blasted away by the severity of the pain. We hadn't anticipated a pelvic surgery at all because only 3-5% of the type of pelvic fracture that I have, doesn't heal themselves. Well that was not the last time during my recovery I would enter into that narrow margin. Just trying to write my own text book instead of following the one already written, I suppose. During my first check up with my surgeon, Greg reminded me about the most important complaint I'd had. How could I have forgotten? Relaying to my surgeon that my pubic bone had been "popping" for the last week was imperative. It gave a pretty big wallop, one that Greg could hear and if he was carrying me, he could feel. My surgeon stopped walking and talking instantly. I did not enjoy the look on his face. After a few questions, he immediately scheduled me for some x-rays and a CT of my pelvis. He dropped the bomb on us that my pelvic fracture did not heal as expected. 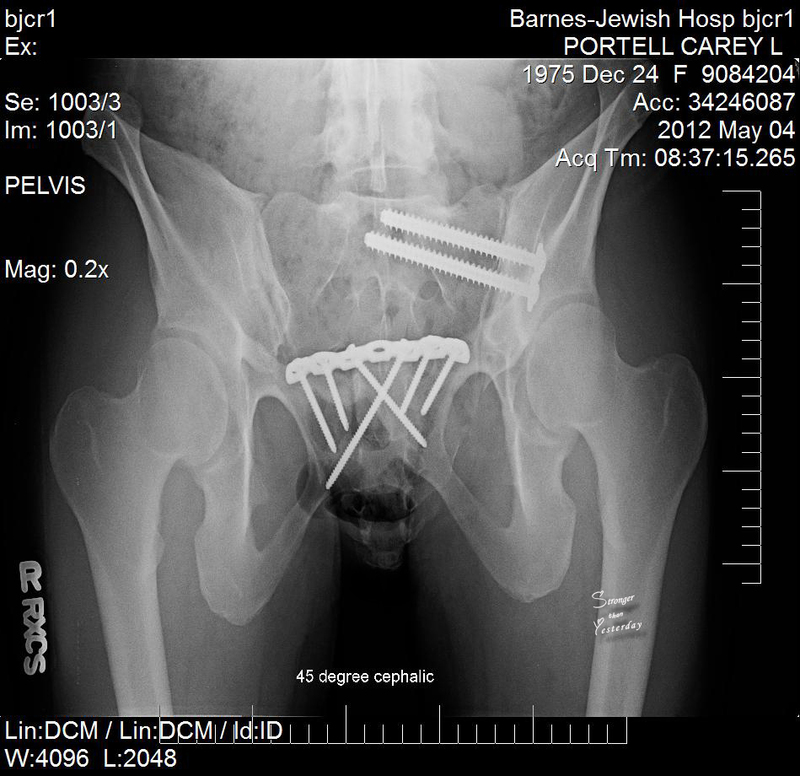 The surgeon must put two bolts in my left posterior pelvis and a plate and screws on my pubic bone to hold my pelvis together. Had I known, how many more surgeries I would have to recover from, I probably would not have taken this unplanned surgery so hard. Fast forward to the surgery date, as Greg and I entered the pre-op room, some of the hospital staff had recognized us because I had already been there three times in a matter of weeks. I was baffled since none of these smiling faces were recognizable to me. It seemed the next minute I was lifting my eyelids open and knew instantly I was leaving the operating room. I awoke to the huge lights moving above me and noticed the door thresh hold as we passed through it. Nursing staff were wheeling me to Recovery and only seconds had passed when an atrocious pain began to radiate from my lower abdomen. Within moments it was unbearable. I asked the nurse where I was and why I was feeling so much pain. A male nurse stated that I wasn't supposed to be awake yet. He informed me that I was at Barnes Hospital. I truly did not believe him. My teeth started chattering violently, I had no control over my body as I began to shake. He asked me if I was cold or if I was in pain. I told him it was horrible and pleaded with him to make it stop. As soon as we made it to Recovery I was given Morphine, but the pain would not lessen. This was not any different than the other surgeries, the only difference was that this time, I was remembering the experience. The nursing staff could not give me anymore morphine as it slowed my heart to only four beats per minute. I was transferred to the Orthopaedic floor where I could be injected with Dilaudid and finally I slept. The last morning of my stay the Physical Therapist announced that I would have to start rolling to each side if I wanted to leave the hospital. I can't describe how badly I did not want this order. I was in anguish laying flat on the bed and NOT moving as much as possible. They also announced that I did not have a choice. It took several nurses along with PT to accomplish this exercise. The staff positioned pillows and pulled up sheets as they rolled me to my left side. Uncontrollable, horrible groans involuntarily rushed past my lips and grazed hard against my teeth as it felt like muscles were being torn from my bones themselves. My God, how much more, just how much more pain? I wanted to sob and tell them to leave me! They were patting me softly as they told me what a great job I had done and that they would be back in a few hours to roll me to the right side. I mentally groaned as I thanked them for their unwelcome torture. The right side movement wasn't as terrible as the left roll, but the last feat I had to accomplish was sitting up. This is killing me. I must have given that poor physical therapist a look of, "Are you flippin' kidding me?" because she snickered and told me that I could do it. I knew I could do it, I just didn't want to! She was patient as I was moving at the speed of a slug. It was absurd how difficult this was. I had finally sat up and she let me rest a mere moment before exclaiming, " Okay, now into the wheelchair!" For the love of Pete, just smack me with a two by four and put me out of my misery! I knew of course I had to move or I would not be leaving. I also realized she was correct when she told me the more I moved the better I would feel, so I obliged. Two bolts and four very long screws were installed that day. Yes, we estimated maybe they were a little too long in length for my anatomy. Six months later the plate and screws were removed, only to allow my pubic bone to start popping again. This meant that one side of my pubic bone was overlapping the other and when I moved, it popped or scraped against each other to return to it's original position. Not great. Four months later a plate and six screws were reinstalled and this is how I will always stay. Things do have a tendency to "catch". At that time I stop and move around until movements are attainable again. I cannot move fast and cannot perform some actions at all. 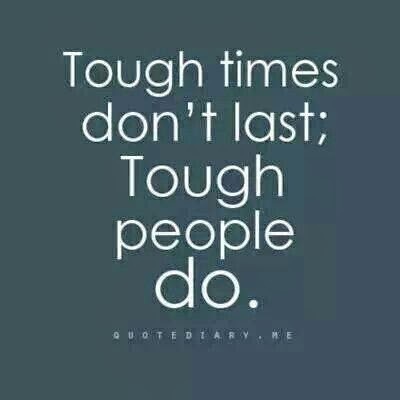 Exercising is a trial and error process. My sanity is modification, being creative with my thought process. I do develop frustration at times and I also develop patience and gratitude for the lessons that these injuries teach me.